Since I was still in Puerto Rico for a portion of this week there still isn't much that got accomplished. Other than business stuff I did complete one class and I think I got an A. I also got my closet cleaned and much of the house straightened up. I really need to get the product that is in boxes all over my living room into storage. Everywhere I look there is a box filled with something! 1) I got tons of supplies in. I rearranged my storage cupboards, my entire workspace, my drying/curing racks, and my supplies in general. It is much easier to find things as I put nice big labels on everything. I spent lots of hours on the phone trying to track down supplies that I didn't receive and have had to even call the credit card company to put a stop payment on some things. What a hassle! 2) I melted down all the cocoa butter I bought into manageable ice cube size pieces. I get it in a huge 35 lb piece that I need to break apart with a hammer and chisel. (well this time C did the hard labor) Then I melt it down and put it into ice cube trays so it is easier to measure out later. 3) I made three big batches of soap: Oatmeal, Milk & Honey, Black Cherry Oatmeal, and Figment. 4) Got all the lotion bars (300) that were made last week labeled and shrink wrapped. I have to admit I had help getting all of this stuff done; as usual C & J really came through. I have my first show for the year next weekend- it is a Wholesale Show so I hope to come back with lots of accounts and a list of store you can find my stuff in. Wish me luck! How is the wax seperated from the honey? § wax press : The wax press consists of a strong cylinder with a plunger attached to a coarse screw. Heating can be supplied by steam or an electric element. The press is partly filled with water and the contents soaked for a couple of hours before the heat is applied. After boiling gently until heat penetrates the material, the press is screwed down and most of the remaining wax floats to the surface. When the water level is raised, the wax flows out into a mould. § cappings reducer or melter: Cappings melters are commonly built of stainless steel and have an electric heating element in the base. The element is completely covered with water and the wax cappings added. By adding water into the bottom of the melter, the liquid wax rises until it flows out through a 1 to 3 mm gauze strainer into moulds. Moulds should have tapered sides to allow the wax to be easily removed. The rich color of beeswax is a result of the floral sources the bees forage on. Beeswax is almost pure white when first secreted, but gets its color from the pollen and propolis the bees gather. The natural variations in color range from almost white to almost black. There are three major types of beeswax: a yellow kind, a white variety (bleached beeswax), and beeswax absolute (absolute cire d' abeille ). Yellow beeswax is the crude beeswax first obtained from the honeycombs themselves. White beeswax and beeswax absolute are derived from yellow beeswax, the former by bleaching with the combined action of air, sunlight, and moisture (or with peroxides) and the latter by extraction with alcohol. White beeswax is produced by bleaching the constituent pigments of yellow beeswax with peroxides, or preferably it is bleached by sun light. Learning about Coconut Oil this week was pretty difficult because if you surf the web you'll find dozens of claims about its medicinal uses. If you search any of these sites yourself, be sure to take these claims with a grain of salt and remember, if it sounds too good to be true, it probably is. Coconut oils are derived from the nuts of the coconut palm (cocos nucifera. The tree is highly productive averaging a figure of 60 nuts per year. The mature nuts have a hard shell surrounded by a thick, tough, fibrous husk called "coir." Inside the shell is the coconut water and the white "meat" from which coconut "milk" is expressed. The meat also holds the oil, a mixture of mostly saturated tri(acyl)glycerides used for cooking, for makingsoap and for various cosmetics and personal-care products. Harvesting the nut before maturity yields more water and a smaller quantity of softer, more edible meat. There are basically two types of oils from the coconut- oil made from Copra (or the dried meat of the coconut) and Virgin Coconut Oil- made from fresh meat. In copra processing, developed in the 19th century, coconutmeat is scraped out of the shell, and then sun-dried. The resulting copra can be stored for a long time before extracting the oil. This was essential in the days when a copra trading ship might call at a remote island only three times per year to buy raw material for a rendering plant hundreds or thousands of miles away. Once the copra is delivered to the mill it is put in a corkscrew like press at temperatures over 200 degrees F (called cold pressing). The "cold pressed" oil is actually a rancid oil labeled "crude coconut oil - not fit for human consumption". The crude coconut oil is then refined, bleached and deodorized so that it can be sold as a food. The refining process is done by adding caustic soda to the oil. The main purpose of refining is to take care of free fatty acids which are actually caused by the oil becoming rancid prior to processing. Then the oil is bleached which is usually done by passing it through diatomaceous earth. The main purpose of the filtering is to make the crude coconut oil into a clear oil. The last step is deodorizing, as this coconut oil still has a bad taste to it. The deodorizing process is done by heating the oil up quite hot and bubbling gas through it while a vacuum pulls off the vapors. In the end you have a tasteless, odorless, coconut oil. 2. Wet-milling. With this method the oil is extracted from fresh coconut meat without drying first. "Coconut milk" is expressed first by pressing. The oil is then further separated from the water. Methods which can be used to separate the oil from the water include boiling, fermentation, refrigeration, enzymes and mechanical centrifuge. Well, not a lot got done during Week 3 because I took a little break and went to Puerto Rico for some sun & fun. Besides getting to visit some of C's family (which is always awesome), we went to Arecibo and saw the world's largest radio telescope. Go see the site at http://www.naic.edu . Even if you're not technically inclined, it is an amazing ride to get to it and then to think it was built in the 60's just is mind boggling. We also went to the Rio Camuy Cave Park. You can go to http://www.wavcentral.com/whites/puertorico/pr3.html to see some cool photos that aren't mine but give you the idea. And on Sunday we went to the Festival Calle San Sebastian. Once again, not my photos/web site but you can get a feel at http://www.studioporto.com/fiestasansebastian. We are going to look into becoming a vendor there and maybe fly down stuff and sell for the weekend; there are TONS of people! 1) The soap I got made last week got cut up, and some of it got milled so I could be a soapin' fool this week! 2) I figured out how to get pictures onto my blog. I'm so excited! 4) I made 300 lotion bars. They just need to be labeled and shrink wrapped. Well I've figured out how to post pictures!!! Here is what has gotten acomplished on week 2 of 2005! 1) I finished and sent out items that I made for a swap. It is a new product that I have been working on and I am excited about the feedback I will be getting from these other soapmakers. They are ladies and gents that make exquisite products themselves, so I know I'll get honest and positive feedback. 2) I've gotten this blog up and running the way I want. Although I still need to figure out how to put up pictures.. but I'm sure that's not too far away. 3) I got all of the fragrance and essential oils I will need for '05 ordered. I've realized I have no clue where I will store them when they get here, or if I have enough Boston Rounds to store all the oil in either. I am also positive they will all come while I am away next week, leaving my neighbor with half a dozen leaking boxes, because the contents are always broken when I'm not home to get a hold of UPS and make a claim. 5) I got all the show applications due in January filled out and sent out. I tried again to get into Mayfair in Allentown. I wonder why I bother, its just throwing the $25 jury fee out the window. If I don't get in this year I officially give up! 8) I made eight 16lb batches of soap. Unscented. It will be ready on Monday to mill and rebatch into something with fragrance and color. 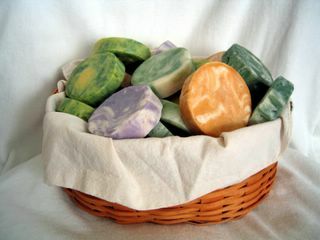 9) I made test batches of the Figment, Almondine, Ginger-Lime, and Gardenia soaps. I think I like the color of the Figment, sort of mauve. Almondine is just goning to be tan, not much I can do about that, its because of the fragrance. Ginger-Lime looks like it should be Watermelon (pink & green) and I don't know if I will keep that for the final color or not. Gardenia I made a yellow and teal swirl. I think it will just be yellow and white for the final color, the teal seems gaudy. 10) I received 15 lbs of fragrance and got them rebottled into glass (shouldn't store fragrance in plastic). I have the best smelling garbage in town from disposing of the plastic containers they came in. I made it though my first week of school with only one late assignment! So far classes are going well and I'm really getting into the groove. ...is an edible vegetable fat obtained from cocoa beans. Cocoa Butter contains natural antioxidants, provides a barrier on skin to help retain and restore moisture and improves skins elasticity (good for use on a pregnant tummy). Cocoa Butter is a stable butter with a shelf life of 2-5 years. How is Cocoa Butter Extracted? The fat or cocoa butter can be extracted from the bean in a number of ways. Pure press butter is extracted from the cocoa mass by horizontal presses. Sub-standard cocoa beans can be pressed without deshelling by using continuous expeller presses. Pure press butter needs no cleaning but it is often deodorized. A solvent extraction process can be used to extract butter from the cake residue left after the expeller process; this type of butter must be refined. How is Cocoa Butter Deodorized? Deodorization of cocoa butter is done using superheated steam under vacuum. It entails the steam stripping and distillation of volatile substances from the butter. The process can take between 30 minutes and 3 hours depending on the degree of deodorization required. How is Cocoa Butter and other Cocoa Products used in the Cosmetics Industry? Cocoa butter - It is widely used in cosmetic products such as moisturizing creams and soaps. Potash from cocoa pod husk - Cocoa pod husk ash is used mainly for soft soap manufacture. To prepare the ash, fresh husks are spread out in the open to dry for one to two weeks. The dried husks are then incinerated in an ashing kiln. 1) 2005 Catalog: Its been revamped, updated, and is in the final stages of being checked for correct spelling and grammar. Note: Glitter Gel has been discontinued in 2005. This means what is made will be sold, and once it's gone, its gone. 6) 100 lbs of beeswax clarified. Since the blocks of beeswax I get from a local apiary are anywhere fron 2-10 lbs each, I need to remelt the wax and pop it into molds that make it more manageable to store and weigh for use. 7 days= 100 lbs. 7) New Inventory System. Updated to include mail orders, and consignment stores. I will have a much more accurate view of what is out there and what is in here. Well on top of getting all that done (with some help thanks to C & J) I started school (Organazational Psyc and Microsoft Word) and even got some of the housework done!